Ricky Miller (left) playing for Luton. Barry Fry has confirmed Peterborough United are monitoring the progress of prolific Dover Athletic marksman Ricky Miller. Miller, a local lad from Bretton, has scored 21 goals in 20 games for National League side Dover this season. He scored in both games against Cambridge United in the first round of this season’s FA Cup. Posh goalkeeper Luke McGee celebrates victory at Northampton on Saturday. Photo: Sharon Lucey. At 27 Miller does not fit the profile of a usual Posh transfer target, but his goals return has attracted the attention of several Football League clubs. He’s scored 15 goals in his last nine appearances. Fry also revealed that negotiations to extend goalkeeper Luke McGee’s loan from Spurs are ongoing and that wantaway striker Joe Gormley won’t be officially allowed to leave Posh until January. Gormley wants to quit English football and return to Northern Ireland. 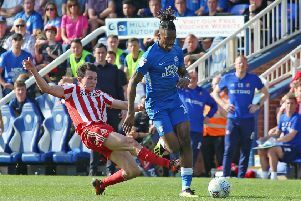 Director of football Fry, the man in charge of transfer negotiations at Posh, said: “We have been watching Miller. He’s a goalscorer and we are always interested in goalscorers. Posh striker Joe Gormley (right) is in limbo until January. “That’s all at the moment though. We are keeping tabs on five strikers and we want to sign two of them. It’s up to the manager which two we go after. “Miller is a bit older than the ones we normally sign, and that is a concern for the chairman, but as always he will back his manager’s decision. “What we all want to do is be ready to sign players on January 1 rather than January 31. “We all want to keep Luke McGee here for longer. Tying him down is a priority for us. We are talking to Spurs and they are saying all the right things, but we have nothing in writing yet. Miller was also a regular goal-scorer with local clubs Stamford AFC and Spalding United before working his way up the Football League ladder through Boston United to Luton Town. Miller only started three games, and only scored twice as a full-time professional with Luton before returning to Dover for a second spell. Posh are also believed to be interested in St Albans striker Junior Marias who has been training with the club and turning out for the Under 23 side. Winger Harry Anderson and striker Aaron Williams are among the players currently away from the ABAX Stadium on loan.